Racing in the IRONMAN World Championship is more than just a bucketlist item to check off—it’s a life-changing event that puts you in the company of a select few of the world’s best endurance athletes. If you made it to the starting line, chances are you’ve raced enough to understand the demands that an IRONMAN will put upon your body, and you’ve been training consistently enough to be ready to take on this challenge. However, there are a number of things about the IRONMAN World Championship course that can surprise a first-timer. Additionally, there are a few things that many athletes wish they had remembered to do at their first world championship that either would have made the day go by more smoothly, or would have allowed them to soak in the moment just a little more. Here are five tips for IRONMAN Hawaii first timers that will help Kona newbies make the most of their day on Saturday. Many first-timers say that their only goal for the day is “to just finish,” and that’s all fine and good—but even if your particular goal for race day is not time-based, try to dial something in a bit more so you have the right mindset on race day. You want to feel the need to work toward something, but not so confined in your goal that if things don’t go perfectly as planned you’ll consider the day a complete waste. Most Kona athletes made it to the starting line by putting very detailed time and fitness goals in place, and then training toward them diligently. If you feel fit enough to put a time goal in place for Kona, then go for it, but make sure this time is reflective of your abilities for the unique demands of the world championship course. Goals are not meant to cause negative stress, in fact, if your race goals constantly bring you anxiety, then your ability to perform on the day will be at risk. Think of your first-time in Kona as an opportunity to craft some race goals that bring you excitement about the challenge, not anxiety. Maybe your goal is to be able to negative split your swim, or simply be able to run the entire way through the Energy Lab. Whatever your goal, make sure it is also somewhat flexible. The only thing one can count on during an IRONMAN is for something unexpected to pop up. Be prepared for this, and try and roll with the punches as much as possible. Losing 30 minutes because of increased headwinds or a mechanical doesn’t mean your entire day is over. Be prepared for all the things you can control, the chief of them being your attitude. If you get a flat tire at mile 50 of the bike, throwing a tantrum while you fix it won’t make you lose any less time. It’s okay to be upset for a moment, but take a deep breath, do what needs to be done, and then focus on moving forward. It’s a long day out there for everyone. Everyone will tell you heading into your first IRONMAN World Championship to “stay within yourself” and “don’t go out too hard.” These are both very true, but it really doesn’t mean much if you don’t know what “staying within yourself” really means. The first step to putting together a pacing plan is understanding how the particular demands of the IRONMAN Hawaii stack up against your own abilities. If you’ve never run faster than a four-hour marathon, well, chances are you won’t get a marathon PR in Kona—and that’s okay. When it comes to doing a race like Kona, the ability to know just how hard to go so that you can still have enough gas in the tank to run a solid marathon is key. One of the best ways to put together a pacing plan is by using predictive analysis tools, like those available through Best Bike Split, which uses your power data, course specifics and race-day conditions to help you create a perfect race plan. You can even print your power plan out and place it on your bike so you know which zones you should be in throughout your ride, which not only keeps you honest, but also helps you stay focused during your ride. Nutrition (and hydration) are probably the biggest components of a successful day in Kona, and it cannot be stressed enough that nothing about your nutrition needs should be left up to chance on race day. While most of your nutrition planning should start months before your race in the form of specificity training, sweat testing and learning which products work best for you—if you’ve made it this far by winging it, by all means take the time to write out a plan! Write out a schedule for race day, starting with what you will eat and when once you get up. Be as detailed as possible, and make sure that you have some back-up nutrition and fluid options either on you or in your special needs bags. Know beforehand if you can tolerate the options available on course, and by all means, don’t try something out for the first time on race day! Spend some time before race day getting your mind in the right space for your race. Visualization techniques are a great way to do this. Find a quiet place where you can be alone. Visualize every moment of the race, from the way you will feel when the gun goes off, all the way to that wonderful moment when you run down Ali’i Drive and cross the finish line. Mentally prepare yourself for things that might go awry by visualizing yourself dealing with them in the best way possible. It’s often beneficial to come up with a specific “race-day mantra.” This simple statement should be positive, action-based and comforting. Meditate on it before the race and then repeat it to yourself during the race to bring yourself strength and, most importantly, to help bring you back into the moment when things get rough. Any time spent on your race-day mental focus will be well worth it once the gun goes off, so take the time to get away from your family and social commitments during the week to be alone with your thoughts and help craft them into positive statements you can pull from later on. 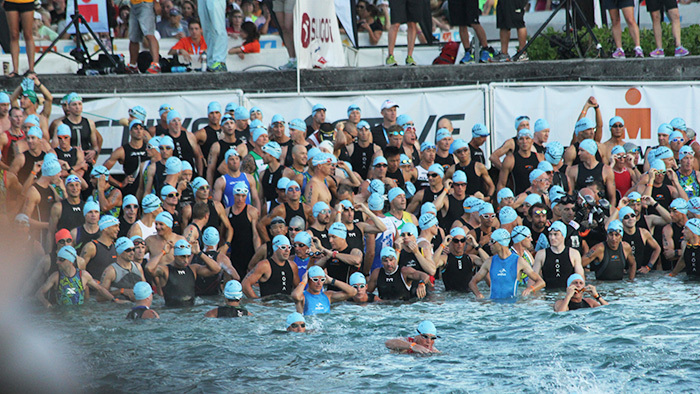 For every first-time Kona athlete, there is at least one place on the course that you were excited to experience. Maybe it’s the start of the swim, the turnaround at Hawi or the famous final run down Ali’i Drive on your way to that finish line. Wherever those parts on the course may be, make sure that you take the time to really experience them. Stay in the moment. Recognize your accomplishment—and own it. And, use them to reel you back into a positive state of mind when things get hard.